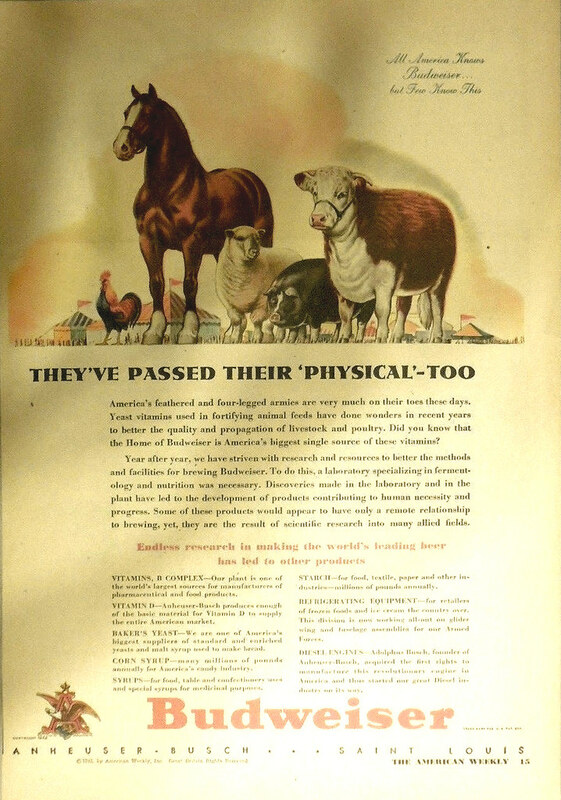 Tuesday’s ad is for Budweiser, from the 1940s. 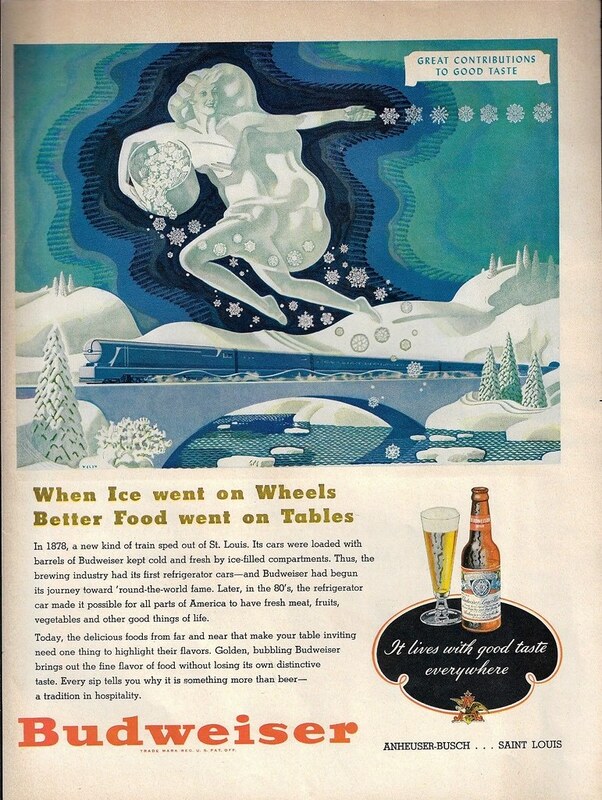 This ad features the story of how in 1878 Anheuser-Busch began using trains with ice cars to keep their beer cold during transportation. But the image is more art deco than 19th century. The train is certainly more modern and the ice queen throwing giant snowflakes from her bucket of ice. Monday’s ad is for Budweiser, from 1945. 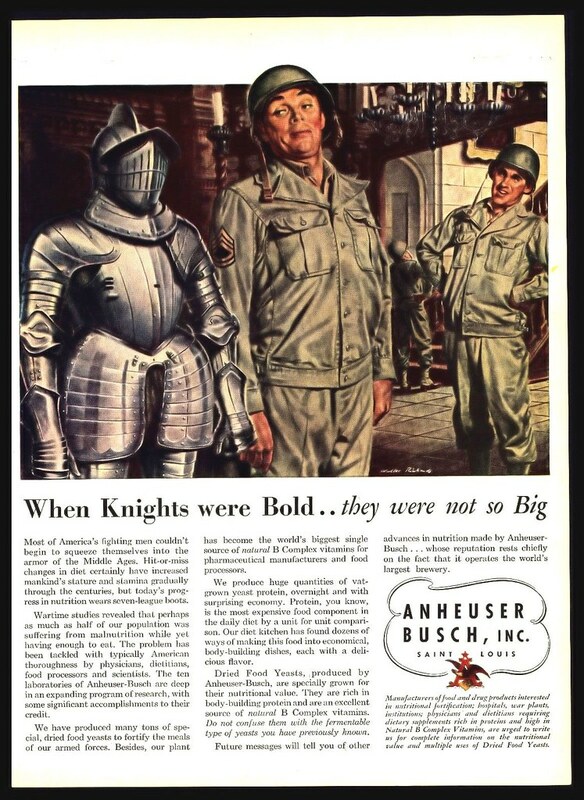 This World War 2 ad features American soldier in Europe, presumably liberating a museum, measuring themselves against a suit of armor and finding that “When Knights were Bold .. they were not so Big.” And that’s primarily due to nutrition, which apparently has been enhanced by the research into yeast and protein and others that A-B has been engaged in. It would probably help if everyone drank more beer, too. Sunday’s ad is for Budweiser, from 1944. 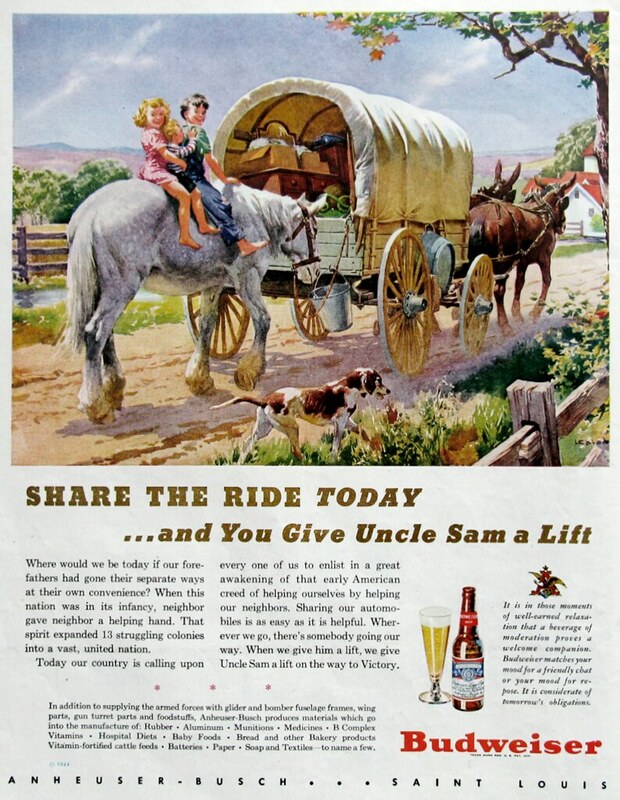 This World War 2 ad features a trio of kids hitching a ride on a horse being pulled by a covered wagon, with the headline “Share the Ride Today … and You Give Uncle Sam a Lift.” It’s all about neighbors helping neighbors, which is always a good idea. Saturday’s ad is for Budweiser, from 1943. This World War 2 ad features a bald eagle flywing in the sky with three American glider planes above. Apparently Anheuser-Busch’s Refrigeration Division was retooled to build gliders for the war effort. Friday’s ad is for Budweiser, from 1944. This World War 2 ad features a colonial minuteman standing vigilantly in a field behind a team of oxen as a young boy points to where the trouble is. 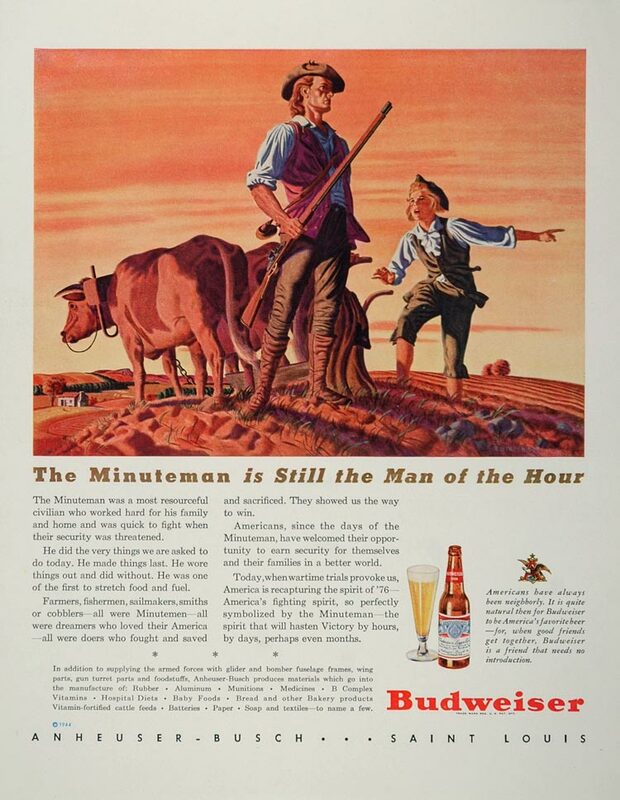 The ad claims that “The Minuteman is Still the Man of the Hour,” comparing them to the soldiers of the day fighting in World War 2. Sure, why not. 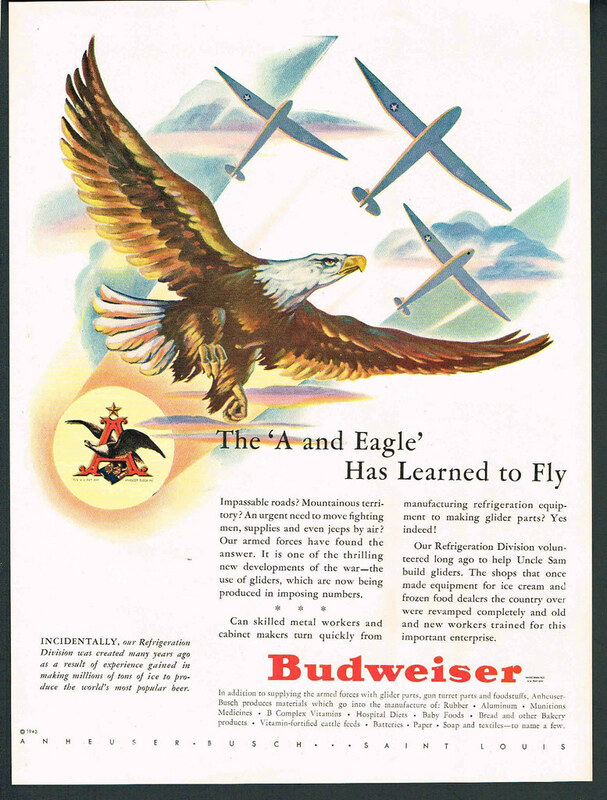 Thursday’s ad is for Budweiser, from 1943. 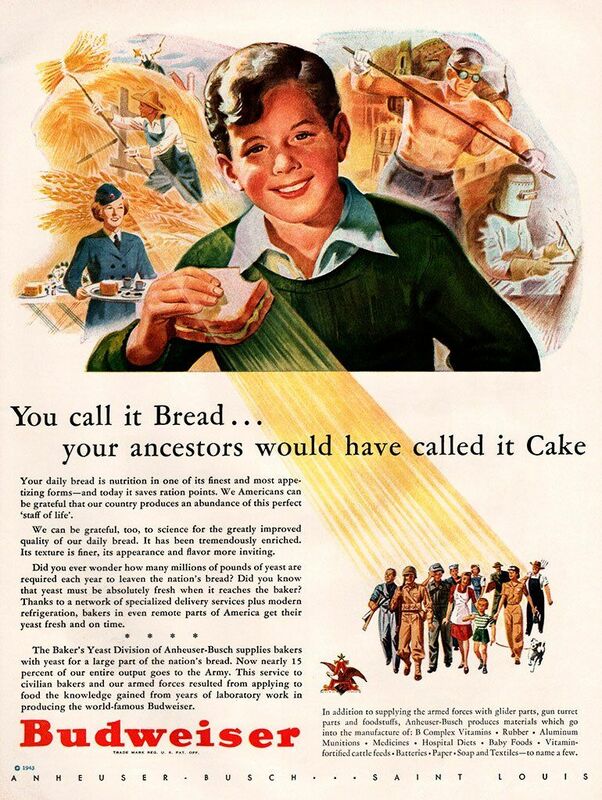 This World War 2 ad features a smiling boy holding a sandwich with the headline “You call it Bread … but your ancestors would have called it Cake.” Luckily during war we had an abundance of our daily bread, a.k.a. “the staff of life.” But look at the four illustrations behind the boy. The two on the left make sense. First, there’s a farmer harvesting wheat, which is used to make bread. Then there’s a woman in uniform holding a tray of bread. So far so good. On the right, there’s a shirtless man wearing white gloves and goggles holding a long metal rod. There’s also a giant vat behind him, the kind you see in steel mills. So why the hell is he shirtless? That makes no sense. Then there’s a man sitting but wearing what looks like an early hazmat suit with a diving bell helmet. What do either of those have to do with bread? Wednesday’s ad is for Budweiser, from 1942. 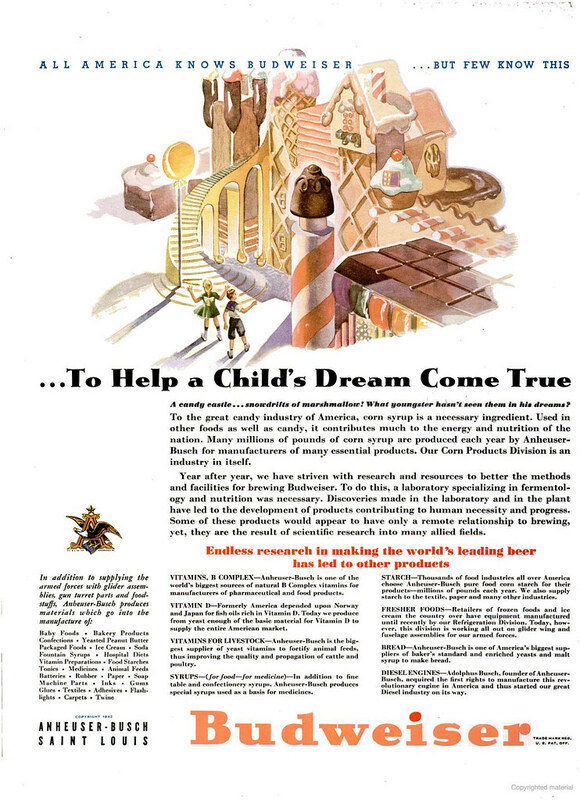 This World War 2 ad features a giant house made of candy, and then comparing that to how corn syrup is a necessary ingredient in candy. And thanks to A-B’s research into corn and all the vitamins that are part of the brewing process, they’re helping a child’s dream come true. Tuesday’s ad is for Budweiser, from 1942. 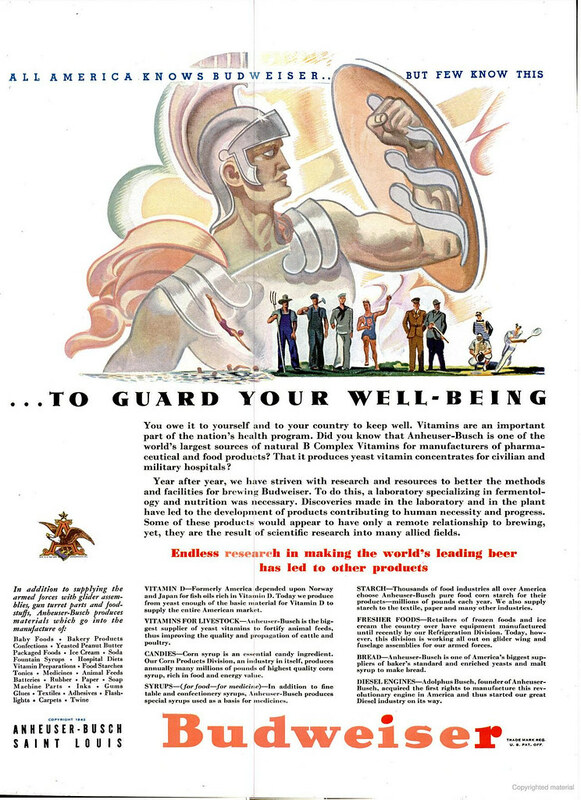 This World War 2 ad features an ancient warrior protecting us, and then comparing that to how vitamins also protect your well-being. And thanks to A-B’s research into all the vitamins that are part of the brewing process, they’re guarding your well-being, too. Monday’s ad is for Budweiser, from 1942. 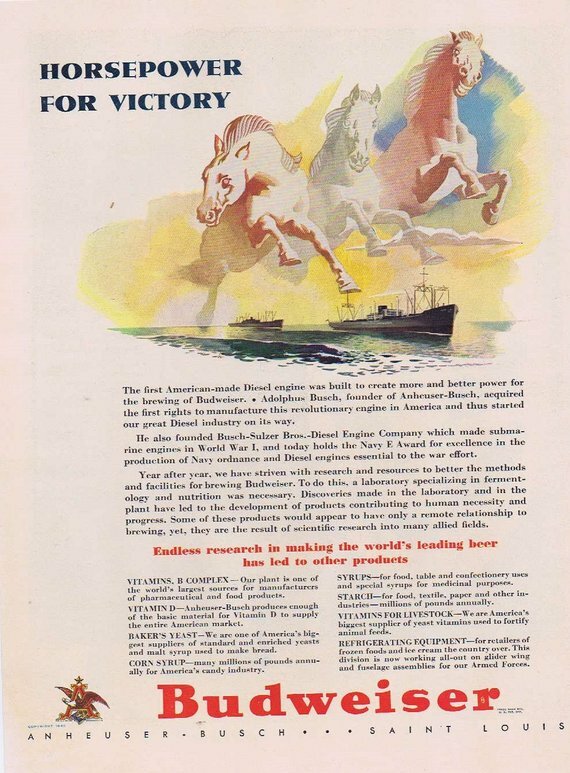 This World War 2 ad features ghostly horses riding the sky above Navy warships to illustrate the power of diesel engines which, according to A-B, were first built for use in their breweries. Hmm.